Where are you? 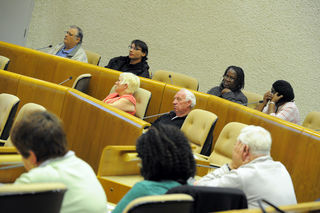 Home > News > Local News - Wolverhampton Tenants News > Our Debate ' To buy or not to buy? Our Debate ' To buy or not to buy? Our debate on Friday 22nd June 2012 was very informative. Russ Borrowman a retired housing professional, spoke in favour of the Right to Buy. He outlined the history of the legislation and how successive Governments have supported it and how the latest regulations that were introduced in April this year have invigorated the scheme by offering increased discounts up to a ceiling of £75,000. He went on to say that the problem we face as regards social housing is the lack of investment and he sees that there is a need to build new social housing and in particular Council housing. - there are now opportunities for Council's to build again and he hopes that Wolverhampton will come to an arrangement with the Government for this to happen in Wolverhampton. Mark Henderson from Wolverhampton spoke about some of the draw backs to the Right to Buy and the advantages of being a Council tenant. (ie security, social rents and succession). Basically he said purchasing wasn't necessarily the way forward when taking into account high mortgage rates and high maintenance costs and the costs of services for leaseholders (those buying their flats). He also said that the service provided by Wolverhampton Homes had improved with there being high levels of satisfaction and the condition of properties being upgraded through the Decent Homes programme. He said the opportunity for new build is not that straight forward under the terms proposed by Government as Wolverhampton will only be able to use a per centage of monies received from additional sales - so it looks as though we will have to sell 3 to build one. He said that we would have 3 years to invest the money from sales into new build - if not all the money from sales will go to back to Government - with interest. Furthermore rent on any new build will be at so called affordable rents - higher than social rents but below market levels. He said he did not feel selling to build was the answer to meet housing demand in the City. Councillor Peter Bilson, Deputy Leader of the Council, who was in the chair, summed up the arguments and said that Wolverhampton would be looking to build new Council homes. A vote was taken - on balance is it right we should continue with the Right to Buy as an option - is it a good thing or a detriment to the housing market. It was a very close thing with a slight majority against whilst there were several abstentions.